How to prepare your site for better Alexa rank.......? In my last article I mention about "what is Alexa......?". There I discussed some important things of Alexa ranking. Today my main focus is on "how to prepare your site for better Alexa rank......?". 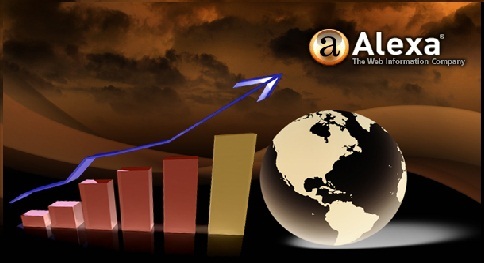 Why it is important to prepare the site for Alexa rank.......? Most of the time Alexa contain a rank to all our site, unless it is too young to add like 2-3 weeks. Even though all sites have Alexa rank, it is important to induce Alexa ranking by various ways by making site in a Alexa friendly manner. Other problem with Alexa is that they do not calculate any traffic which will not go through Alexa (tool bar). Due to that unless your users have install Alexa tool bar for there internet browser you will not get any traffic for them. There are such other problems in the Alexa too. Therefore it is preferable for you to optimized your site for that to have better Alexa rank. How to register your site to Alexa.......? As I have mentioned earlier Alexa has include all your sites. If you are not sure about it please follow this link and add your link in search box. Then if you have not registered yet. you can visit here and claim your site. They have 4 plans for you. From that select free form. complete you registration. How to verify your site for Alexa.........? After registering your site you will see the Alexa Verification page. You can visit there and verify your site this link is provide on site which have domain name of "http://abcdeaaaaagh.com". 1. Here select the second part as it is very easy to deal with. 2. You then select one of the parts on picture to further process. 3. If you have already insert meta tags you may use second option of second part and if not you use whole meta tag as part one. 4. Go to template and edit template. After that find </head> cord by pressing the "Ctrl+F". 5. Paste the tag you have copied as a keyword of keyword meta tag or whole meta tag as mentioned above. 6. At last save the template in blog and click the Verify button in the Alexa. 7. Now, you can see a massage about your verification. How to make the site to use more traffic.......? To have the benefits of all your traffic even which does not come trough Alexa tool bar installed computer, you have to some tool in your site. That is Alexa widget. If you have install this, some of your users will go through it and give you a review. So ask them to give you review. If your site get more expose to Alexa, you will get good page rank (according to my experience). You can Install Alexa widget by following link. To get your widget you will have to change the URL to your one. Enjoy more with the Alexa and contact me If you have more to discuss. The next article on Alexa will be on how to get use of these tools further more... be patient up to that. Thanx Ever So Much Brother! It Helps!